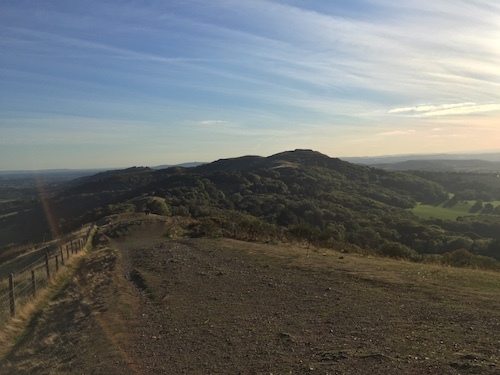 Spread along the horizon to the north-east of Ledbury, stretches the bumpy spine of the Malvern Hills: a designated area of outstanding natural beauty, enhanced by iron age hill forts and ancient pathways. At over six hundred million years of age the geology of this formation is one of the oldest in the country. 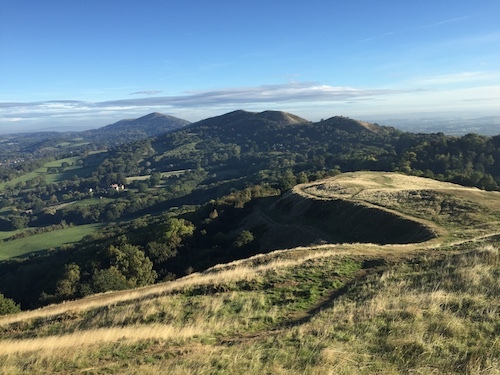 The Malverns has stood as a natural barrier between olden realms, while today they divide Herefordshire and Worcestershire and have Gloucestershire meet them to the South. Walk up to its ridge and beacons, and the spectacular views roll away—the Black Mountains of Wales in the West, less populated and wilder than the Severn Valley and the Cotswolds to the East. On a clear day you can see thirteen counties and the cathedrals of Worcester, Gloucester and Hereford. 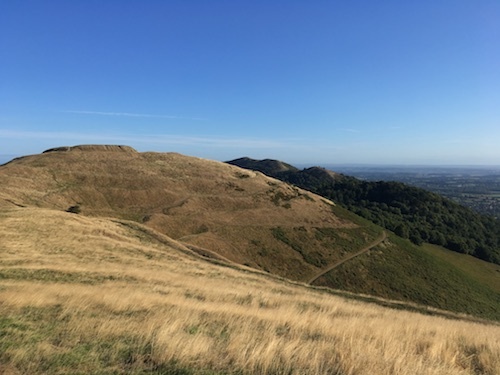 Strung along a thirteen kilometres length, twenty-two hills make up the Malverns. Some of their names; Raggedstone, Midsummer, Hangman’s Hill, Swinyard and Perseverance, evoke an England of long ago. You are walking in the footsteps of the past. It is now believed that the Shire Ditch running north-south along the ridge is a prehistoric pathway from Midsummer Hill fort to the Worcester Beacon. 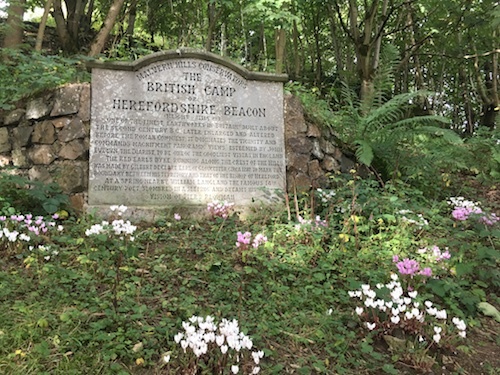 It is the walk up to the Herefordshire Beacon—otherwise known as British Camp—to which I regularly return. 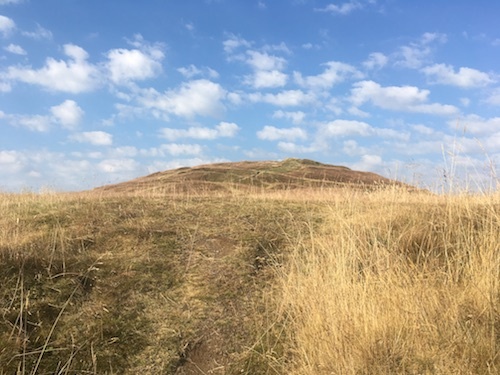 Protected as a ‘Scheduled Ancient Monument’, the Beacon is an Iron Age fort whose top ramparts are the relic of a Norman motte fortification. Its fallen meringue of earthworks winding around the hill, date from the second century BC. Folklore has it this is where Caractacus, the Ancient British chieftain, had his last stand against the Romans. This may be apocryphal but, certainly when you are here, you want to believe it. I come here in all seasons and in all weathers and it is always a joy. My favourite time is the early part of the morning when the light is soft and thin mist often rolls up and over the hills like steam. 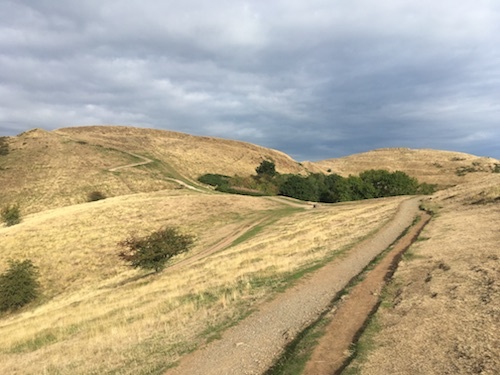 As you walk the ridge from the Beacon summit and head south to the distant Monument, the weather clears and,on either side of you, the patchworks of fields sweep away to the far horizons. 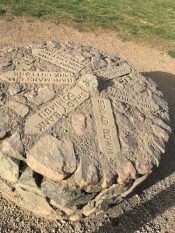 The Malverns have influenced too many artists to name-check, but famously this is where William Langland’s fourteenth century epic poem “Piers Plowman” is set. 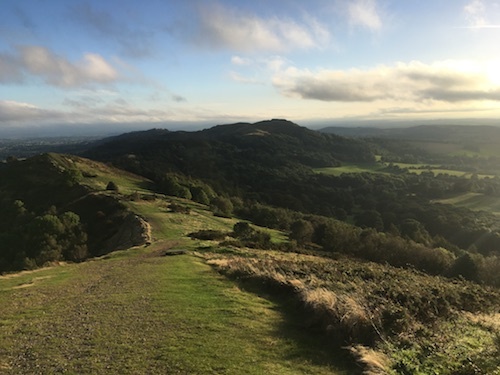 The views here inspired the famous shires of JRR Tolkein and perhaps the Narnia of his great friend and fellow Malvern Hills walker CS Lewis. Elgar roamed these hills and is buried nearby and WH Auden taught English at the nearby Down’s School. 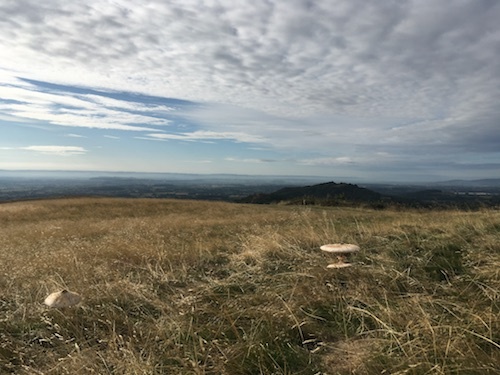 When you walk the Malvern Hills, you still look out on a timeless England, mostly untouched by modernity. In the seventeenth century, diarist John Evelyn described the view from British Camp as ‘One of the godliest vistas in England’. It still is.